Looking for that do-able travel experience that’s special, memorable and offers relaxation and fun? Don’t have heaps of time planning the perfect getaway, but want a break and an easy life? Max reward for little effort? 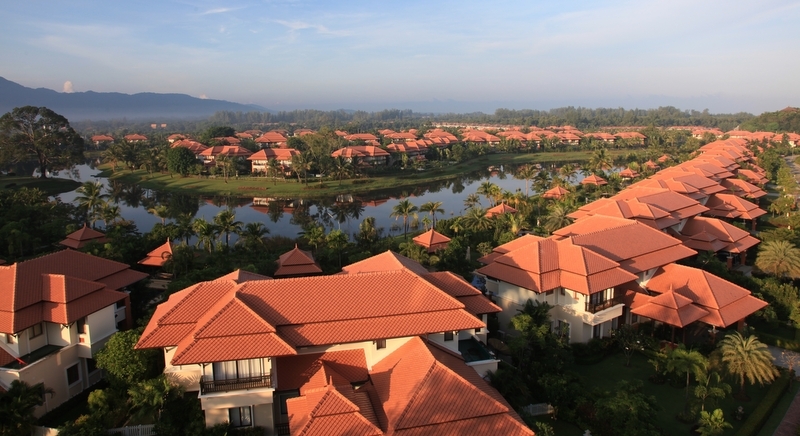 An aerial view of Angsana Villas Resort. 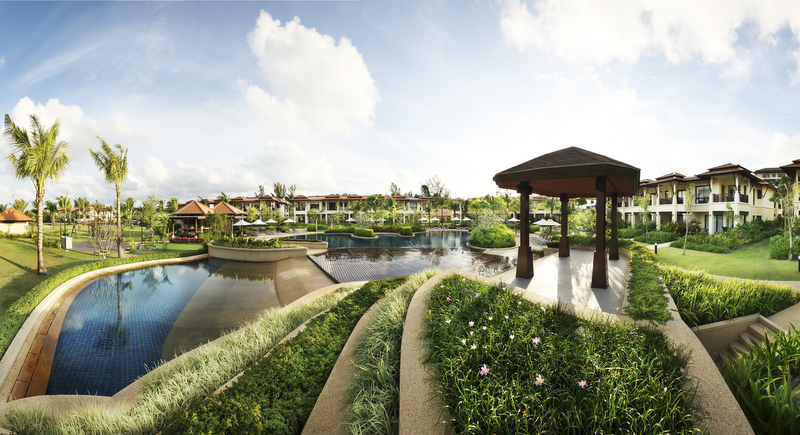 The central lagoon is surrounded by luxury villas. 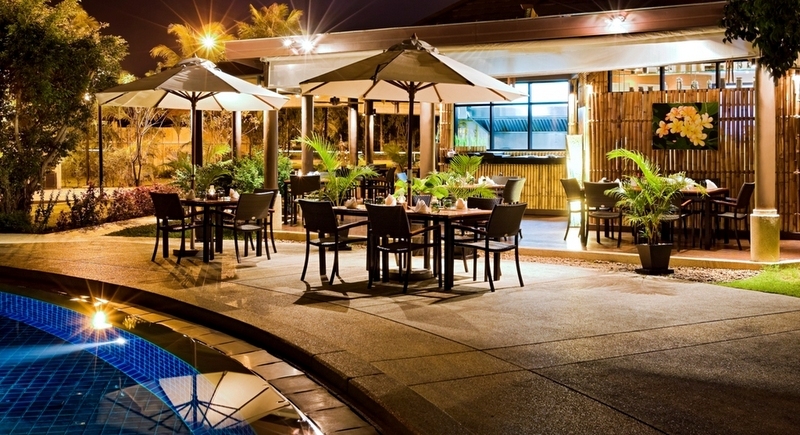 Enjoy a meal or a cool drink by the pool. Dive in for a swim or just enjoy relaxing on a sunlouge with a good book. There are plenty of activities for the kids. 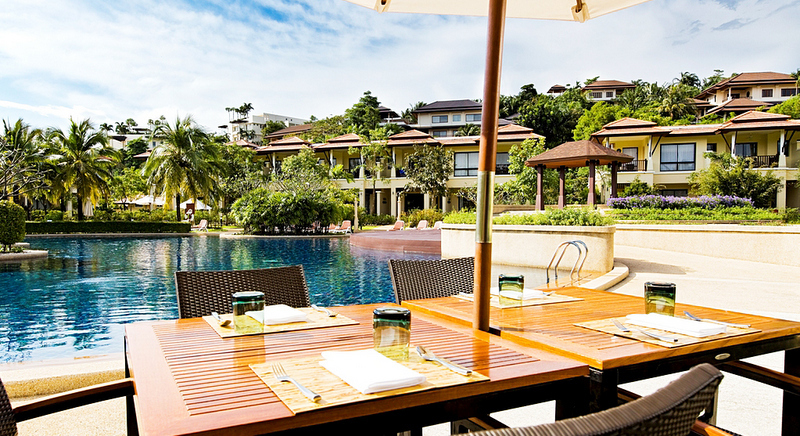 If you answered yes to most of the above and a short break or family vacation is on your travel shopping list, then the Angsana Villas Resort in Phuket, located just minutes from the island’s airport, might be the answer. 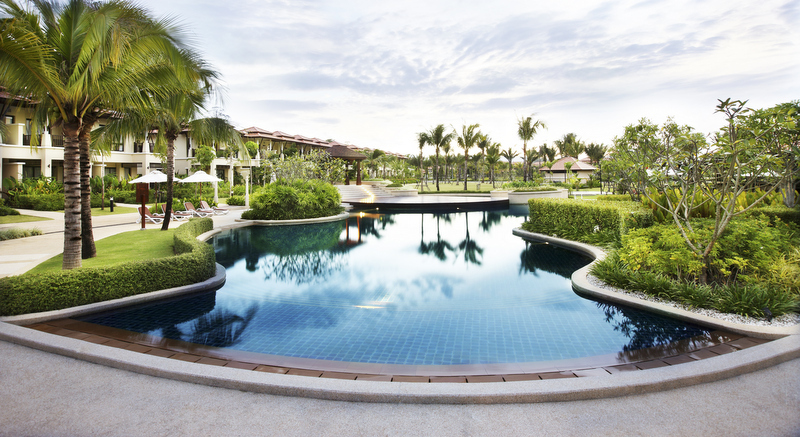 Set around a hidden lagoon and a large pool, in what is described as a new kind of resort community, Angsana Villas has comfort and style of a luxury resort paired with all the space of your favourite vacation home. 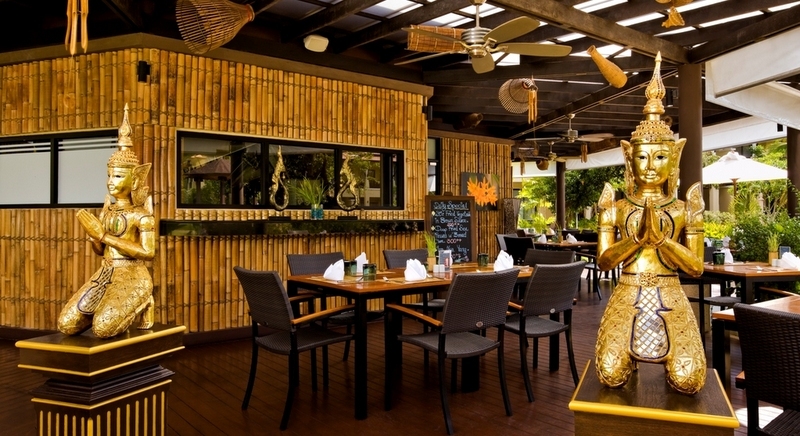 Set within the larger Laguna Phuket area, guests staying in any of the Laguna’s hotels can take advantage of the many restaurants, shops, spas and golf that Laguna has to offer. The Angsana Villas is one of those world-class hotels – it really is a beautiful resort, with manicured gardens and swaying palm trees. We stayed in a one-bedroom suite, it was spacious and came equipped with a full kitchen. The accommodation is perfect for vacation stays for young families with kids, that wish to have family meals together. The kitchen had everything – from a huge fridge to a large oven and a microwave. All the equipment that you would need – coffee maker, kettle, pots, pans, chefs’ knives, utensils, crockery, cutlery, it was all there, including a four-ring hob, water cooler and extractor fans. Our large balcony included our own sun loungers and assorted outdoor tables and chairs. The design of the suite is modern and luxurious, the bedroom area is separated by a sliding wall which gives the suite a great feeling of light and space throughout. It has a good quality TV and AV system. When we arrived it was the end of a two-week road trip vacation from Bangkok. I’ve lived and worked in Thailand for the past 26 years so we were relatively mobile having our own car – although this is not essential. The resort has golf buggies for moving around the Laguna complex and also daily shuttles into town and to the beach which are easy to book. The Angsana Villas Resort was a perfect choice for us. Once at the resort we didn’t really explore much. We just chilled out. In the past week prior to arriving in the Laguna area we had visited Phuket Town, Wat Chalong and the Big Buddha. Phuket’s Big Buddha is one of the island’s most important and revered landmarks. The huge image sits on top of the Nakkerd Hills between Chalong and Kata and, at 45 metres tall, it is easily seen for miles around. It’s well worth a visit for the views alone. The hotel has a wide range of facilities including a kid’s club, which was very popular with families that were staying in the resort during our visit. There is also a gym and the enormous pool in the centre of the resort. If you are a serious swimmer it’s great for laps. 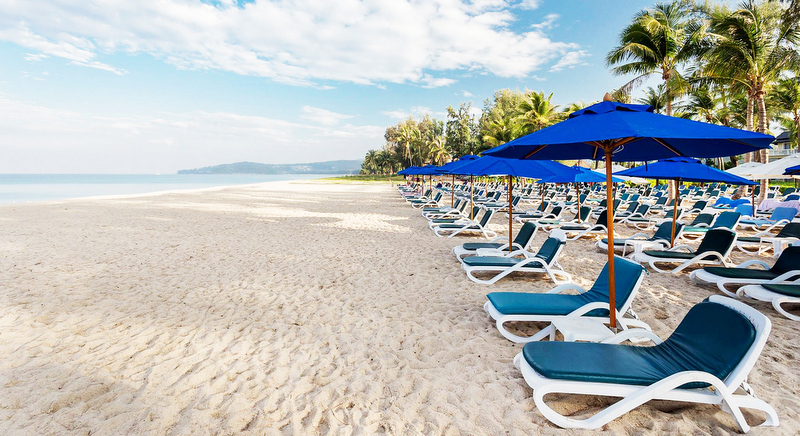 There are plentiful sunbeds and umbrellas and shaded, cushioned poolside cabanas. We particularly liked these to simply relax and chill. Grab a good book; order a cocktail, on with the headphones, lay back. Perfect! There is a poolside bar and the Panache restaurant is located in this area too. It’s a bright coffee shop/brasserie with acres of glass. 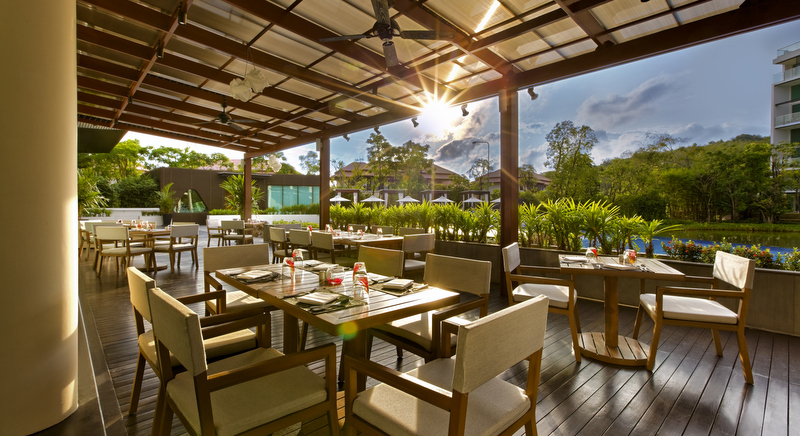 You can choose either indoor or al fresco dining. Breakfast is served here also with a good variety of offerings, you’re bound to find something that appeals. During my visit I asked to inspect one of the many villas. I learnt that the most popular were three-bedroom pool villas that are perfect for a larger family travelling together. It is a house on two floors with its own pool and small gardens. The villa was beautifully appointed and included kitchen and laundry. If you are thinking of travelling as a family or with a group of friends it would be ideal. The staff throughout the resort were extremely caring and nothing was too much trouble. All the staff were very child-friendly and clearly enjoyed interactions with all guests making them feel comfortable and at home. The open plan of the resort’s lobby area is cool, clean and inviting. Bright with orange, yellow colour tones. A positive happy space filled with flowers. Friday night is seafood night and we made a good decision to join the seafood barbecue at the Panache restaurant. The cost is B1,190++ and for this you get an absolutely wonderful array of freshly barbecued seafood and a full buffet with oysters; sushi, sashimi, multiple salads and hot dishes, as well as desserts and ice creams. The barbecued tiger prawns and rock lobsters were delicious and fresh and cooked perfectly. The outdoor barbecue area had a skilled chef. We thoroughly enjoyed our short visit to Angsana Villas and whilst we may not have fully experienced everything that the area had to offer we would definitely come back. Andrew J. Wood is a travel writer and a regular university guest lecturer. A long-time resident of Thailand, Andrew is a former hotel general manager and Immediate Past President of Skal International Thailand. Andrew is also a Director of Worldwide Destinations Asia Co Ltd in Bangkok.